Another strategy to overcome dissolution rate limitations is to provide the compound in a non-solid form, or most commonly, some type of solubilized formulation, where dissolution isn't necessary. This really amounts to providing the compound in combination with excipients that are able to solubilize the compound prior to introduction to the media of the GI lumen, and then avoid significant precipitation of drug upon dilution into those media. As will be discussed, these systems can often end up providing supersaturated drug levels upon dilution of the solubilizer and compound. The solubilization of a compound describes the ability to increase the total concentration of drug "in solution". It is important to understand that the only way to increase the apparent solubility is through either increasing the free energy of the solid phase, which was discussed in some examples above, or by providing an alternative media or equilibrium in which the compound becomes "solubilized". In effect, the compound becomes solubilized by decreasing the chemical potential of the compound in the "solvated state" by providing preferential solvation or sequestration in a facile and reversible system. It should also be realized that the chemical potential of a compound in a compound-saturated cosolvent solution is, by definition, no greater than that of a saturated aqueous solution, i.e. both are in equilibrium with and dictated by the chemical potential of the solid state. Therefore, while the total solubility in a cosolvent system may be 5 to 50 fold higher, maybe more, the actual driving force for transport across a membrane will still be similar. This has been demonstrated with respect to transdermal permeations studies (Higuchi, 1960; Pellet et al., 1994; Megrab et al., 1995; Pellet et al., 1997; Iervolino et al., 2001). However, it is very common to see enhanced transport or absorption when dosing with cosolvent types of systems. This is likely to be related to potential for supersaturation or membrane perturbation, which will result in enhanced transport, again demonstrated with membrane permeation studies (Pellet et al., 1994; Pellet et al., 1997). One way of increasing the preferential solvation, is through the use of a miscible cosolvent that confers on the mixed media new solvation properties through highly correlated changes in physicochemical properties such as solubility parameter, dielectric constant, hydrogen bonding potential (Yalkowsky, 1999). While the solubilization capability of these solvents is the functional impact desired, it is offset by the limitations of toxicological response following in vivo administration. Even during lead optimization stages, care must be taken to insure that the desired compound properties (pharmacology, toxicology, etc.) are not masked by the cosolvent. It is also very difficult to sort out the potential impact of the cosolvent on the membrane barrier itself, which leads further to questions of the degree of reversible or nonreversible change that actually occurs with the membrane barrier. Furthermore there is evidence of potential changes in physiological parameters such as gastric transit times with the use of common cosolvent formulations (Basit et al., 2001; Schulze et al., 2003). The most common cosolvents are ethanol, glycerin, propylene glycol and polyethylene glycol, with the latter two often being preferred because they usually provide the greatest solubilization relative to the amount of vehicle that can be safely administered. Representative LD50 values can be found in Wade and Weller, 1994. The general relationship between solubilization by coslovents is usually a logarithmic increase in compound solubility with increasing volume fraction of the cosolvent. While this allows for exponential increases in solubility with increasing cosolvent addition, it also results in an increased propensity for precipitation of drug upon linear dilution of the drug concentration in the aqueous mileu upon administration (Figure 1). Precipitate formation can vary from the formation of very large aggregates with low surface area for redissolution (obviously undesirable) to a finely dispersed nanoparticle material with extremely high surface area. Depending on the compound and composition of media, it is often possible to maintain varying levels of supersaturation for extended periods of time prior to precipitation. This type of in situ formation of supersaturated solutions, coupled with potential physiological changes due to the cosolvent and the inherent variability of animals, makes it very difficult to interpret the actual impact of cosolvent solubilization on compound delivery and, more times than not, results in high levels of variability in the resulting exposure. Therefore, while such cosolvent systems may be able to afford exposure during lead optimization studies, they are not really a viable formulation strategy to take forward as part of an overall package for drug candidate selection, i.e. a compounds need for cosolvent solubilization to obtain exposure is not really consistent with a compound which has "drug-like" properties. The remaining solubilization methods are oriented around the generation of an alternative equilibrium for "sequestration" or "solubilization" of a drug. The method of first choice is generally pH adjustment, providing the molecule has an appropriate ionization constant. This approach takes advantage of the typically high level of solvation of a charged species and the ionization equilibria to provide a total solubility equivalent to the sum of the intrinsic solubility of the weak base and the solubility of the protonated form of the weak base. Taking into account the ionization constant (pKa), the total solubility for a weak base can be described by the solubility profile shown in Figure 8. The total solubility at the pKa is twice the intrinsic solubility, and then with each pH unit below the pKa, the total solubility will increase by a factor of ten. 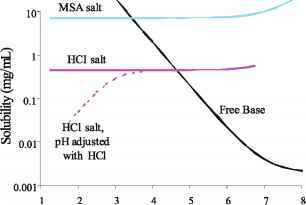 It is important to note that the total solubility does not increase indefinitely with a decrease in pH, at some point the solubility of salt will become limiting. As shown in Figure 8, the saturation solubility of the salt is dependent upon the counter ion; in this plot, as is often the case; the methane sulfonate salt is more soluble than the hydrochloride salt. The saturation solubility of a salt is typically characterized in terms of the equilibrium solubility product (Ksp) (Morris et al., 1994). It is noted here that the total solubility can actually decrease with the further addition of an acid that contains the counter ion of the precipitating salt, i.e. further addition of hydrochloric acid results in precipitation of the chloride salt. Figure 8. Solubility curve (bold line) for a free base (pKa ~ 7; intrinsic solubility ~ 2 |g/ml) showing limiting solubility of the salt is dependent on counter ion. The methane sulfonic acid (MSA) salt is more soluble than the hydrochloride salt. Additional pH adjustment with hydrochloric acid can actually result in decreased solubility due to the common ion effect. Figure 9. A 250 mg dose of a weak base (pKa ~5.3) is diluted in a total volume of the about 250 ml in the stomach to yield a concentration which is less than the solubility at pH 1.5 -3. On reaching pH 6-6.5 duodenum, even with some dilution, the concentration will now be significantly greater than the solubility and precipitation is likely to occur. The ionized form of the compound is generally regarded as being non-available for membrane permeation and as such contributes minimally to the concentration of unionized form driving the flux, however the proton transfer of ionization is very rapid and the ionized form of the drug is able to act as a sink to replace any non-ionized compound absorbed. As with other solubilization methods, an adjustment of pH upon administration or upon transportation down the GI track can result in a rapid shift of the ionization equilibrium and precipitation of the poorly soluble unionized form. Figure 9 provides an example where the drug may be dosed as a solution into a total volume (resting stomach volume plus formulation volume) where it is soluble, but as the compound is emptied into the duodenum where the pH is now closer to six, the total amount of drug in solution now exceeds the solubility by more than 100-fold, resulting in a supersaturated solution leading to precipitation. This pH effect often results in a greatly reduced exposure for weak bases and a highly variable response from animal to animal. Preparing a pH-adjusted solution for dosing corresponds to preparing a solution of a salt in situ. The preparation of such solutions or suspensions of the salt can be used to overcome the dissolution rate limitations that may occur with the free base. It is important to recognize that the formation of salts of a drug really only address dissolution rate-limited exposure and the total solubility will still be dictated by the pH of the media, with the solubility of the unionized form of the drug remaining constant and in equilibrium with the precipitated unionized form. The formation of a salt is not going to increase the solubility of the drug at a given pH in the GI tract, it may impact how rapidly the saturation solubility is obtained, but not what it is. With respect to oral exposure, the value of salts, is to enhance dissolution rates and provide the potential propensity for supersaturation prior to precipitation. The dissolution of salts and the importance of pH and various buffering ions in that dissolution process has been very nicely explained in work by Mooney and coworkers (1981a; 1981b). The selection of counter-ions and appropriate salts for further investigation will generally include many aspects of solid state chemistry besides the biopharmaceutical ramifications. Readers are referred to reviews that also include the importance of the physical and material properties of the salt in further processing, formulation, manipulation and storage (Morris et al., 1994; Ware and Lu, 2004). The use of surfactants for purposes of solubilizing compounds continues to be a popular approach. Largely due to toxicological reasons, the nonionic surfactants are highly favored and through formation of a micelle, provide the lipophilic poorly soluble compounds a stable "nonaqueous" environment to reside in. The preferential partitioning of compounds into the micelle is often related to the octanol-water partition coefficient (Mithani et al., 1996). The total compound in solution (compound in micelle and free compound) increases linearly with a linear increase in surfactant concentration once the surfactant concentration exceeds the critical micelle concentration (CMC) of the surfactant. While this linear response limits the degree of solubilization somewhat, it minimizes the potential for supersaturation or precipitation upon dilution. Even if there is precipitation of drug, the presence of surfactants in the solutions can facilitate the dissolution solids. Similar to solubilization by cosolvents or pH adjustment, surfactants can be used to overcome dissolution rate limited absorption. The sequestration of the compound in the micelle provides a continual sink for compound to partition from and become available for absorption. While this sequestration in a micelle can help to overcome dissolution issues, the maximal compound available for membrane transport will still be limited by amount of free drug in solution, or the saturation solubility of the drug. Solubilization by sequestration in micelles is a good example of where the total amount of drug in solution increases but the "free compound" or effective concentration to drive flux across a membrane is actually reduced. The impact of compound sequestration on caco-2 transport has been addressed in conjunction with potential for inhibition of polarized efflux pumps by surfactants (Nerurkar et al., 1996). Evidence consistent with reduced free drug concentrations has also been demonstrated for perfusion models using rat intestinal segments (Poelma et al., 1990). In some cases, compounds have properties that will allow them to be dissolved in neat surfactants or in mixtures of surfactants, lipids and cosolvents, which upon contact with an aqueous media can result in formation of micelles, microemulsions or coarser emulsions, depending on composition of the vehicle. These self-emulsifying drug delivery systems (SEDDS) have been discussed by many and are the subject of the chapter by Charman et al. in this book. The solubilization of compounds in these systems and the mechanism for enhanced absorption from them is discussed in depth in that chapter and other recent review articles (Pouton, 1997; Humberstone and Charman, 1997; Charman, 2000; Bagwe et al., 2001; Gao and Morozowich, 2005). The use of SEDDS-like formulations in early preclinical studies is often limited by the amount of excipients present when conducting highdose toxicological investigations of the compound. While excipient-induced effects are important in high dose toxicology studies, the more realistic doses encountered in pharmacology models or clinical investigations would likely be much more amenable to SEDDS approaches. Hence, while these types of delivery systems may be invoked during lead optimization, they would be largely limited to preclinical proof of concept and generally would not be carried into toxicology studies, but could be reconsidered at clinical stages of development. The use of emulsions and liposomes, which unlike the thermodynamically stable microemulsions, are metastable dispersions which typically use phospho-lipids with and without added lipid components, can provide an opportunity for sequestration of the compound to avoid precipitation and maintain "solubility". Given the appropriate selections of phospholipids, the safety profile permits their us for parenteral delivery of poorly soluble compounds. The utility of these systems has been discussed elsewhere (Collins-Gold et al., 1990; Benita and Levy, 1993; Ranson et al., 1996) and must be used with recognition that the delivery system may influence phrarmacokinetic and distribution properties of the compound. Parenteral emulsions have also been used to minimize the level of drug irritation upon injection of certain poorly soluble compounds, presumably through reductions of free drug at the injection site (Wang et al., 1999). While de novo formulations of macroemulsions and liposomes will often be required, it is often easier, especially at the lead optimization phases, to utilize pre-existing emulsions with extemporaneously added drug (Klang et al., 1998). It should be recognized that characterization and reproducible preparation of these systems can often be very challenging and make it difficult to get consistent data during lead optimization phases where the time and availability of material for characterization is usually at a premium. Solubilization through complexation or association is easily understood in terms of a sequestration of drug in an associated state and free drug concentration. While association with proteins could fall into this category, proteins are seldom used for purposes of formulation, but as discussed in an earlier part of this chapter, they can play a significant role in dictating the amount of free drug available for in vitro assays. The most common formulation strategies using complexation are centered around the use of cyclodextrins, with more emphasis generally placed on derivatized cyclodextrins because of their greater solubility and improved in vivo safety margin. Hydroxypropyl-P-cyclodextrin (HP-P-CD) and sulfobutyl ether-P-cyclodextrin (SBE-P-CD) have both been used successfully for solubilization of compounds for parenteral administration (Thompson, 1997). While there still seems to be a lot of concern about the dissociation of compounds from the cyclodextrins upon dilution or administration, the arguments presented by Rajewski and Stella (1986) seem to make it highly unlikely that the compounds remain bound, except in very rare instances where the complexation constants are extremely high. When cyclodextrin solutions are used orally, care must be taken to avoid an excess of cyclodextrin that would have the potential to actually reduce bioavailability due to sequestration, i.e. no more cyclodextrin than is necessary should be added to the formulation. The impact of cyclodextrins on in vitro membrane transport has been noted (Cho et al., 1995). More often, the use of cyclodextrins at later stages of development for oral delivery involve the formation and isolation of the solid complexes, which generally will provide greatly enhanced dissolution rates to avoid dissolution rate limitations. Combinations of solubilizing strategies can be beneficial in some cases, but most generally tend to work with varying levels of success. Often, combinations of cosolvents and surfactants tend to work against one another, as do cosolvents and complexing agents, as do surfactants and complexing agents. The potential use of combined solubilization methods have been described by Yalkowsky (1999) in his chapter on "Overview and Strategy for Solubilization".